Domtar has led advancements in lignin separation and the development of lignin-based materials in an effort to develop a bioalternative to petroleum-based materials. No longer viewed as merely a byproduct of paper-making, lignin is finding new uses as a green replacement for certain chemicals and materials. In fact, lignin-based biomaterials, including lignin pellets, have the potential to be used in a wide array of applications. The use of lignin as a biomaterial has gained momentum in the past few years, beginning with Domtar’s installation of a commercial-scale lignin separation plant in Plymouth, North Carolina, in 2013. Today, we are using state-of-the-art extruding equipment to deliver commercial-grade lignin in dried, compounded and modified lignin granules/pellets, as well as lignin-polymer blends. Our research team collaborated with the National Research Council Canada (NRC) in Boucherville, Quebec, to develop lignin pellets and lignin-polymer compound pellets. Lignin pellets are changing the conversation about the use of biomaterials in industrial products. An early trial with agricultural films is proving a success, and more projects are underway. Domtar recently installed a demonstration plant at a mill in Ontario to showcase lignin pellets as a bioalternative to plastic, chemicals and other industrial products. This project has garnered interest from several industries, as well as support from provincial and federal governments, specifically through Natural Resources Canada’s Investments in Forest Industry Transformation program. Lignin is well suited for bioalternative applications because it’s an abundant non-petroleum source of aromatic compounds of high molecular weight, including phenolics and alcohols. Today, nearly all commercial phenolic compounds and polyols are derived from petroleum, but isolated lignins from woody biomass provide an economically attractive bioalternative that is renewable and sustainable. Our reactive extrusion process simultaneously dries lignin into fused pellets and, if needed, compounds lignin into several upgraded forms that are drop-in ready for downstream users’ processes. Our production capacity is up to 0.75 tons per hour. The technology can compound petroleum-based resins and polymers with lignin to create pellets with lignin content anywhere between 5 and 95 percent. It also can create pellets with moisture content as low as 2 percent while producing a minimum amount of volatile organic compaounds. With assistance from the NRC, our developers are making drop-in ready lignin-thermoplastic pellets. 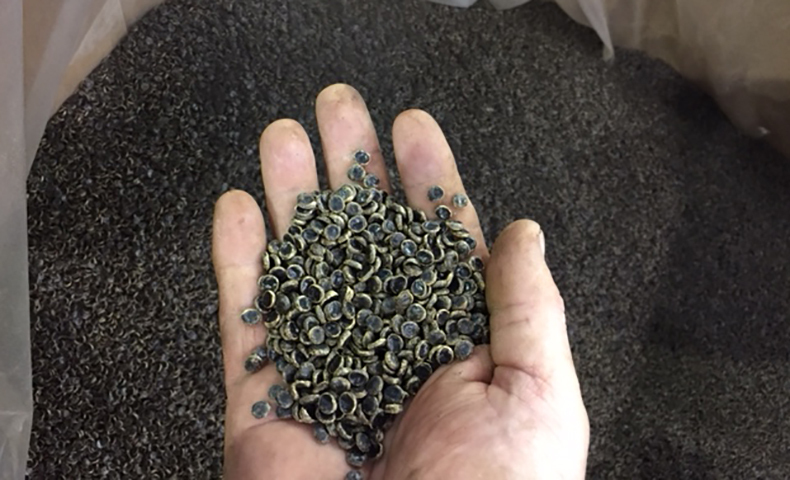 In one trial, these pellets were used in agricultural mulch films that are being tested on farms. John Zandstra conducts research on fruit and vegetable cropping systems at the University of Guelph’s Ridgetown Campus in Ontario. In an interview with Domtar, he said that lignin-based films have potential as a cost-competitive, sustainable solution for farmers growing fresh-market crops, such as peppers, sweet corn and melons. In addition to films, manufacturers could use lignin pellets to create bags and injection-molded products. Industry and university researchers are exploring more applications for lignin and lignin-polymer pellets. Engagement from manufacturers will enhance the process. To learn more about using lignin pellets as a bioalternative to plastic, contact Dale Mitchell, director of business development for biomaterials, at dale.mitchell@domtar.com.